Hurdles abound, but hospitals willing to go the extra mile to create an environment that keeps clinical staff constantly connected will stay one step ahead of the competition. Bedside monitoring devices, nurse call systems, EHR applications, iPads, and smartphones are all becoming commonplace at state-of-the-art hospitals. As more devices such as these require wireless connectivity, the need for bandwidth increases exponentially. To complicate matters, healthcare environments are often among the most difficult places for wireless connections to function properly. Although the obstacles to overcoming this issue are many, IT experts say there are viable solutions. Reandeau notes that when users have difficulty with guest wireless, it’s because there are too many individuals accessing it at the same time. The need for additional planning to ensure sufficient connectivity and proper configuration incurs greater costs. “You get what you pay for. In order to never lose a connection, investment must go up,” Reandeau says. Castiglione, who agrees that cost is a critical factor, notes that for a traditional hospital to go wireless, wires must be installed to establish working access points. Different areas have different requirements—needs vary between an emergency department and a waiting area, for instance—which means that installing cable in a facility can change throughout the environment. Additionally, there may be different requirements for sanitation, safety, and security. Installers often have to attend special training classes to understand specific regulations and perform their jobs properly, which can add more time to the tasks themselves. Beyond that, each state has its own set of safety regulations. State agencies must perform final safety inspections, requiring IT managers to ensure that specific guidelines are met. For example, agencies want to know how installers are mounting certain items, sometimes right down to the type of mounting devices they are using. “Where pulling cable would typically take an hour, in the case of healthcare facilities, the same type of job could take four hours,” Castiglione says. Additional time for training and installation translates to increased cost. In fact, depending on the size of the facility, Maschenic says it could cost as much as $15 million to run wires. Castiglione recommends IT professionals plan meticulously and work closely with strong, reliable partners. Frank Clark, PhD, vice president of IT at the Medical University of South Carolina (MUSC), agrees. The academic medical center, which employs 1,200 physicians at four hospitals, has had wireless connectivity for four years. Reandeau notes that if a hospital system is in the position to do so, the ideal way to go wireless is to plan for the project prior to breaking ground. Sutter’s Mills-Peninsula Medical Center in Burlingame, Calif., took that route. 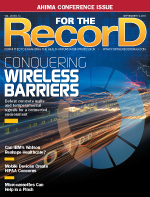 As hospitals convert older facilities to wireless, they face deployment challenges. For instance, Clark notes that MUSC initially encountered obstacles to providing total wireless coverage and solved them over time through trial and error. At Sutter, Reandeau says the existing conditions—concrete walls, 24/7 operations, and the need to “tent” whenever work took place in the ceilings—created formidable obstacles when installing access points. Originally, ad hoc pockets of wireless were installed by request, mainly in conference rooms and shared areas where visitors or vendors needed them most. There were also issues with both clinical and nonclinical devices that did not comply with wireless security standards. Reandeau says this was dealt with through extensive testing and by making exceptions to standards. The plan to cover an entire hospital with Wi-Fi was ultimately driven by the desire for housewide Vocera (a wireless communications system) capability, says Reandeau. This necessitated a complete redesign to Vocera’s specifications and took about six months to complete. At Sutter’s new hospital, the timetable was similar. “It took approximately six months to do the design, coordinate installation with the construction teams, and configure and test the infrastructure,” Reandeau says. To address issues with Vocera in the existing facility, Reandeau and his team worked closely with vendor and support teams to make recommended changes to the Wi-Fi infrastructure configuration. Many IT experts say that if a hospital cannot go wireless from the ground up, it’s important to perform a needs assessment, identify special needs, and locate dead spots. When locating and mending coverage holes, Castiglione recommends a wireless site survey. “Sometimes a rogue device is causing the problem and needs to be removed,” he notes. Adding more access points can also solve the problem, but this entails running additional cable. “Do what’s possible and what’s realistic based on expense,” Castiglione says. Maschenic says as technology advances, the way it’s used in a hospital setting changes too. “A common question among caregivers and patients alike is ‘Why can’t I bring my tablet or smartphone to the bedside?’ Patients want to check in and take a more proactive approach. And it’s now all coming together—everybody wants to go mobile. In today’s world, there is no such thing as a single hospital. It’s a multifacility system. Patients and physicians all move around. They all want mobility and, to them, it doesn’t matter what the technology is. They want to have access whenever and wherever they need it,” he says. As hospitals try to adapt to suit these evolving needs, key questions for IT managers center on the facility’s existing operations. What they sometimes learn is that the burden on Wi-Fi networks is high. Often, they’re outmoded or the infrastructure cannot keep up with demand, particularly when laptops, nurse call systems, SpectraLink phones, and other mobile devices require wireless. While Wi-Fi is considered the best source for communication, tablets such as iPads that are cellular enabled leverage a cellular carrier’s network. “It’s important to ask, ‘What are we trying to accomplish?’ If it’s just about connectivity and devices are cellular enabled, then hospitals can begin to question whether they really need Wi-Fi, particularly when the cost for some hospitals can be daunting,” says Maschenic, adding that older buildings may benefit solely from cellular service, which would ensure connectivity in virtually every area. IT experts agree that while making the transition to wireless has its challenges in the healthcare industry, doing so will ultimately benefit hospitals and patients alike.